A new survey from Pew Research Center found that while the majority of Americans say that White people benefit from privilege by virtue of their Whiteness, most White people disagree. The poll tapped 4,971 people from August 8 to 21. 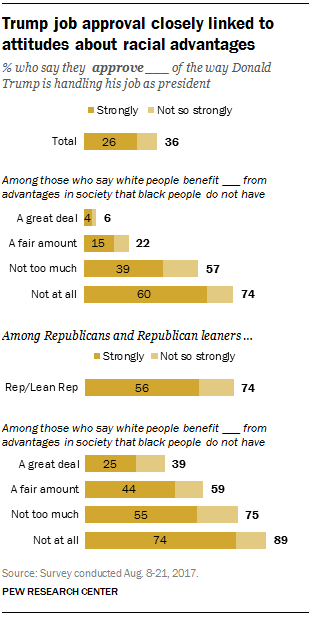 Fully 56 percent of respondents said that White people benefit from advantages that Black people do not have. Just 43 percent of White people agree, while 92 percent of Blacks and 65 percent of Latinx people of any race agree. The poll also found that people who approve of the job performance of President Donald Trump—who said that some White supremacists are “very fine people”—are more likely to say that White people do not enjoy privilege. Seventy-four percent of them say they benefit “not at all” over Blacks.